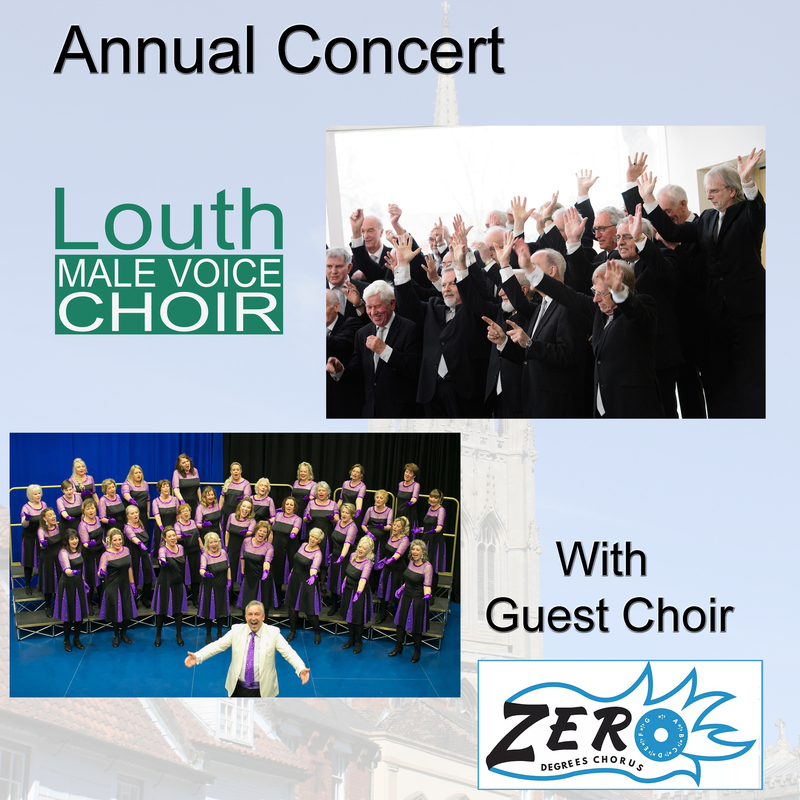 For their annual Summer Concert in St James’s Church on Saturday 23 July, the Louth Male Voice Choir was joined by the Zero Degrees Show Chorus, a ladies’ choir formed in 2014, bringing a new dimension, high voices alternating with low. The concert began with the ladies lined up on stage, but before they performed we were charmed by the magical sound of the LMVC singing under the tower in their usual atmospheric way of starting a concert: Rutter’s The Lord bless you and keep you. A unison beginning was followed by sweetly tuned harmony. The ladies then held the stage for a sizeable chunk of the first half. They describe their style of singing as ‘a capella and barbershop with a modern twist’. All their singing was unaccompanied, and their first item, an arrangement of the Beatles number Can’t Buy Me Love, immediately demonstrated their ability to sing quite complex close harmony not only with great enthusiasm but well in tune and with a slick unanimity of rhythm. This first impression was enhanced as the group progressed: I particularly enjoyed Hallelujah, with its complicated rhythms, while The Climb was impressive for its wide dynamic range. In Rollin’ in the Deep we were treated to actions alongside the music and a tremendous energy of diction, showing just how much the singers were enjoying themselves. Finally, in Let Yourself Go, they did just that, to end the group with a vigorous climax. The ladies’ sparkling costumes, and the way in which they watched the conductor, made a strong impression. Their conductor Chris Mackintosh-Smith is to be congratulated on instilling this degree of enthusiasm and competence into his choir, and his amiable approach added to the evening’s enjoyment. All in all, the LMVC showed us the enthusiasm, unanimity, range and variety that we have come to expect. The second half began with the LMVC, singing favourites from their repertoire. They began with a Sinatra Medley, which had great variety in the singing, including some entertaining syncopated rhythms, delicious close harmony at Strangers in the Night, and a prominent piano part. Other notable pieces included Chatanooga Choo Choo, with snazzy rhythms and specially contrived train-whistle effects, and Rain, which featured not only good singing but a realistic imitation of a storm complete with pitter-patter of raindrops and a clap of thunder. The Zero Degrees Chorus then took to the stage again, and immediately they showed their beautiful blend in Anthem from Chess, accurately negotiating quite difficult four-part chromatic harmony. The same prowess was demonstrated in Once Upon a Time: yet more chromatic close harmony, sung with accuracy and a good dynamic range, and mainly very well in tune. Beautiful Doll was strongly choreographed and performed with immense energy and rhythm, leading to a strong climax at the end. The group ended with Happy, very vigorous, with actions and with audience participation as the singers came down the aisle to mingle. This group was designed to show off the Chorus’s more challenging music… The overwhelming impression was hugely positive. The concert ended appropriately with the two choirs joining together in an arrangement of Shenandoa, bring to a close a most enjoyable evening.